Help Naomi the waitress prepare delicious cupcakes for her customers. Turn the window display to choose the prettiest ones and sit outside with Stephanie on the patio to devour them with a cup of tea! Pet the friendly cat before going back to work. Take a telephone order and then head off on Naomi’s scooter to deliver cute cupcakes all over Heartlake City! This comes down to 11.38 cent per brick. The Heartlake Cupcake Café (41119) Lego set is available from the sites below. However, they do not offer delivery to your selected region. The Heartlake Cupcake Café (41119) Lego set is no longer directly available from the sites below. However, 3rd party partners of these sites might still have the set available. 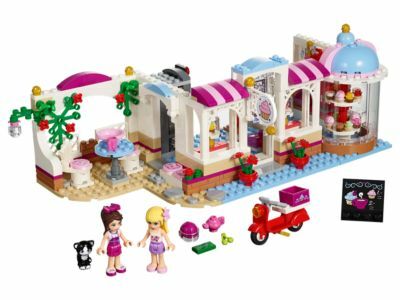 LEGO 41119 Heartlake Cupcake Caf? Friends - Heartlake cupcake caf? Alternate description Try all the cupcakes at Heartlake City’s cutest hangout with baking accessories, revolving display, oven, delivery scooter and outside patio area. Includes 2 mini-doll figures.